Nearly 1.2 million women are diagnosed with breast cancer all over the world every year, and 500,000 women die of it. With the development of treatment strategies, an enhanced awareness of medical examination, and the popularity of breast cancer screening, the 5-year overall survival of breast cancer patients has improved in the last 30 years. The 5-year, 10-year, and 15-year overall survival is 89%, 83%, and 78%, respectively. Analyses of randomized clinical trials have proven that breast-preserving surgery achieves survival equivalent to mastectomy in patients with early-stage breast cancer.,, Adjuvant whole-breast irradiation is performed on these patients as the standard of care. Recently, Jöst et al. recommended the use of the VMAT + IMRT hybrid technique in radiation treatment of breast cancer after breast-conserving surgery, with the whole breast treated with IMRT and the boost volume treated with VMAT. Lin et al. demonstrated that the VMAT and IMRT techniques could be applied simultaneously and that the hybrid-VMAT plan was feasible for whole-breast irradiation of left sided, early breast cancer. It is well known that during radiotherapy, the breast may have setup uncertainties of more than 1 cm. Respiratory motions will cause additional uncertainties in the radiation dose delivery to the target. Although breath hold and active breath control techniques can reduce errors, these techniques might not be feasible for every patient and not all the clinics are implementing these techniques. Previously, Mayo et al. developed a hybrid technique of IMRT plus tangential beams, which could take into account the effect of breathing movement as well as achieve dose uniformity and NT protection. However, little is known about whether VMAT has advantages over IMRT when combined with tangential beams, especially in the SIB radiotherapy of breast cancer patients after breast-conserving survey. The purpose of the present study was to demonstrate the feasibility and advantages of a hybrid VMAT technique in SIB radiotherapy of breast cancer. Specifically, plans of two coplanar 90° VMAT arcs plus tangential beams were compared with plans of IMRT beams plus tangential beams. We investigated dosimetric parameters, including the conformity index (CI), heterogeneity index (HI), and the radiation dose to NTs, especially the left ventricle. Our results provided clinical evidence for validating the use of the hybrid VMAT technique in radiotherapy with SIB for early-stage left breast cancer. Nine patients were enrolled in this retrospective study under an Institutional Review Board-approved protocol. These patients had left sided, early-stage invasive mammary carcinoma (pT1N0M0), and underwent breast-conserving surgery followed by radiotherapy at our hospital between February 2014 and August 2015. Patients between 34 and 46 years old, with adequate function of the liver, kidney, heart, and hematopoietic system were considered eligible for the study. Patients with positive axillary or supraclavicular lymph nodes and distant metastasis were excluded from the study. All patients were immobilized in the supine position with the arm abducted (90° or greater) on the disease side. A computed tomography (CT) scan (LightSpeed RT4, GE Healthcare, USA) with 5 mm slice thickness was acquired for each patient, with coverage from the mandible to 4–6 cm below the inframammary fold to cover the entire lung volume. Imaging data were then transferred to the Eclipse treatment planning system (Varian Medical Systems, USA) for delineation of targets and critical structures. 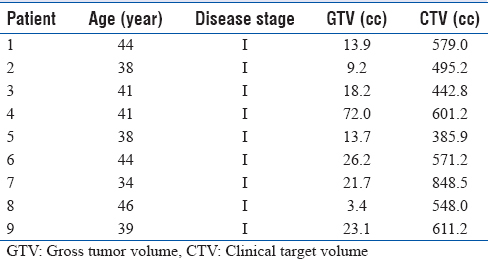 Clinical target volume (CTV) and gross tumor volume (GTV) were delineated according to the Radiation Therapy Oncology Group (RTOG) guidelines. 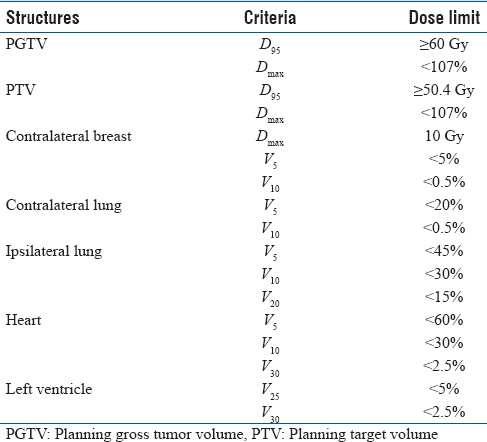 The planning target volume (PTV) and the boost volume (primary gross tumor volume [PGTV]) were expanded by an 8 mm margin from CTV and GTV, respectively, and were restricted to the breast tissue within 3 mm from the skin. Contralateral breast, contralateral lung, ipsilateral lung, heart, left ventricle, and NT were contoured by the same physician on the CT images. The heart was contoured from the pulmonary trunk branches into the left and right pulmonary arteries, and to its apex according to the RTOG 0413 protocol. The left ventricle was contoured from the mitral valve at the cephalic direction along the smooth appearance of the left ventricular outflow tract, and the posterior border was along the diaphragmatic cardiac surface. NT represents the external contour of the patient's body minus the breast PTV, with an additional distance of 0.5 cm. The “hybrid 15°-IMRT plan” combined two tangential beams and four IMRT beams. The standard medial and lateral 3D-CRT beams with control points were created by adding a 2.5 cm expansion margin on the surface of the chest wall skin, and a 0.5 cm margin was added in the other directions. Two IMRT beams had the same gantry angles as that of the tangential beams, and the other two beams were 15° anterior from the nearest tangential beams [[Figure 1] Left]. The “hybrid 45°-IMRT plan” combined two tangential beams and four IMRT beams. Compared to the hybrid 15°-IMRT plan, the hybrid 45° plan is only different in that two IMRT beams were 45° anterior from the nearest tangential beams [[Figure 1] Middle]. The “hybrid VMAT plan” combined two tangential beams and two coplanar 90° arcs. The start angles of the arcs were the angles of the tangential beams, respectively. Each ran clockwise and counter-clockwise for 90° [[Figure 1] Right]. The dose rate was set to 600 monitor unit (MU)/min. The collimator angles of the two arcs were set to 10° and 350°. Figure 1: Beam arrangements of the three hybrid planning techniques. Left, hybrid 15°-intensity-modulated radiotherapy; Middle, hybrid 45°-intensity-modulated radiotherapy; Right, hybrid volumetric-modulated arc therapy. These treatment plans could be delivered using 6 MV photon beams commissioned for a Varian Trilogy linac (Varian Medical Systems, USA). The Linac was equipped with a 120-leaf multileaf collimator, with a maximal leaf speed of 2.5 cm/s, a maximal jaw speed of 1.5 cm/s, a maximal gantry speed of 6°/s, and a variable dose rate of up to 600 MU/min. The isocenter of all plans was placed at the center of the PTV. The IMRT plan was used by sliding window mode. For all patients, the prescribed doses of PTV and PGTV were 50.4 Gy and 60 Gy to at least 95% of the volumes in 28 fractions. In all the hybrid plans, 30% of the PTV dose was delivered by IMRT beams or arcs. Both treatment planning and optimization were performed with Eclipse version 10.0. The optimization objectives and relative priorities were the same for all plans [Table 1]. The dose calculation grid was set at 2.5 mm. The skin flash function was not used. All plans were created by the same radiotherapy physicist and evaluated by the same radiation oncologist. Dose-volume histograms (DVH) were generated for the target volumes and all OARs for dosimetric analysis. Following established conventions, the percentage of a volume that received at least m dose was denoted by Vm and the dose to q% of the volume by Dq. The plans were compared through three parameters: PTV dose conformity, dose homogeneity, and volume of irradiated NTs. The lower the HI value, the higher the dose homogeneity within the PTV. The following dosimetric parameters were compared for the NTs: contralateral breast (D2, Dmean, V5, V10), contralateral lung (D2, Dmean, V5, V10), ipsilateral lung (D2, Dmean, V5, V10, V20, V30, V40), heart (D2, Dmean, V5, V25, V30), left ventricle (D2, Dmean, V25, V30), and NT (D2, Dmean, V5, V50.4). The beam-on time and total MUs per fraction were recorded. All statistical computations were performed using the IBM SPSS statistical package (version 21; SPSS Inc., Chicago, IL, USA). All data in the text, tables, and figures are presented as the mean ± standard deviation as appropriate. Statistical significance was detected using the paired t-test after checking for normal distribution (Kolmogorov–Smirnov test). The Wilcoxon rank sum test was used for values that were not distributed normally. A two-tailed P < 0.05 was considered statistically significant. Patient characteristics are listed in [Table 2]. All the hybrid plans achieved the dosimetric requirements for the target volumes [Table 1]. The dose constraints of NTs were satisfied. The mean volumes of PGTV and PTV were 46.8 ± 17.0 cc and 767.7 ± 159.2 cc, respectively. Examples of isodose distributions are shown in [Figure 2]. Figure 2: Dose distributions of the hybrid 15°-intensity-modulated radiotherapy (left), the hybrid 45°-intensity-modulated radiotherapy (middle) and the hybrid volumetric-modulated arc therapy (right) plans for the same patient. The isodose lines represent 50.4 Gy (yellow), 60 Gy (red), 30 Gy (magenta), and 20 Gy (pink). The three types of hybrid plans were different in PTV dose coverage [Table 3]. The D98 of the PTV in the hybrid 45°-IMRT plans was the highest (P < 0.001). The D50 of the PTV in the hybrid 15°-IMRT plans was the highest. 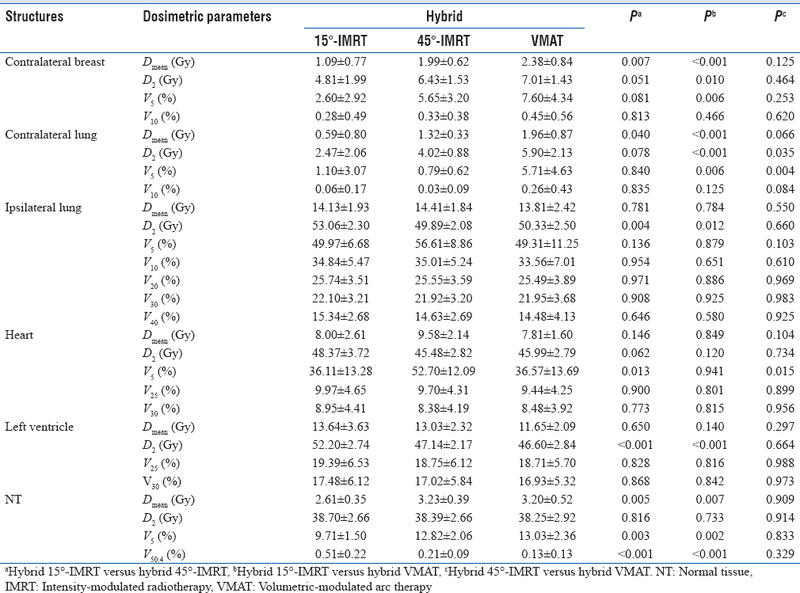 The HI of the PTV in the hybrid 45°-IMRT plans was the lowest but was not significantly different between the hybrid 15°-IMRT plans and the hybrid VMAT plans. The CI of the PTV in the hybrid 45°-IMRT plans was the highest but not significantly different from the hybrid VMAT plans (P = 0.613). The D98 of the PGTV in the hybrid 15°-IMRT plans was the highest but was not significantly different in the other two types of plans. The HI of the PGTV in the hybrid 45°-IMRT plans was the lowest but not significantly different from the hybrid 15°-IMRT plans. The CI of the PGTV in the hybrid VMAT plans was the highest (P < 0.001). The differences in other parameters were not statistically significant in the three hybrid plans. The three hybrid plans were different in their OAR dosimetric parameters [Table 4]. The Dmean, V5, and D2 of the contralateral breast and the contralateral lung in the hybrid 15°-IMRT plans were the lowest, but the difference in V10 was not statistically significant in the three hybrid plans. The D2 of the ipsilateral lung in the hybrid 45°-IMRT plans was lowest, but not significantly different from that of the hybrid VMAT plans. The Dmean, V5, V10, V20, V30, and V40 of the ipsilateral lung were not statistically significantly different in the three hybrid plans. The V5 of the heart in the hybrid VMAT plans was lower (P < 0.015) than that of the hybrid 45°-IMRT plans. The D2, Dmean, V25, and V30 of the heart were not statistically significantly different between the three hybrid plans. The D2 of the left ventricle in the hybrid VMAT plans was the lowest, but the differences in Dmean, V25, and V30 were not statistically significant. The D2 and V50.4 of NTs in the hybrid VMAT plan were the lowest in the three hybrid plans. The Dmean and V5 of NT in the hybrid 15°-IMRT plans were the lowest, but the difference was not significant between the other two plans. By comparison, in the 3D-CRT plans for the same patients, the HI of the PTV and PGTV was 0.30 ± 0.04 and 0.17 ± 0.08; the CI of the PTV and PGTV was 0.54 ± 0.10 and 0.56 ± 0.06, respectively. These parameters were poorer than their counterparts in the hybrid plans [Table 3]. As to the beam-on time and total MUs, there was a significant difference between the hybrid VAMT plans and the other two plans [Table 5]. The beam-on time and total MUs of the hybrid VMAT plans were the least in the three hybrid plans. The VMAT technique has been used in postoperative radiotherapy for early-stage breast cancer after breast-conserving surgery; however, we believe it is for the first time that a hybrid VMAT technique is used in such treatment. The rationale of using two coplanar 90° arcs in the hybrid VMAT technology is as follows: (1) In the VMAT plan, two arcs are needed to optimize dose distribution when dealing with a complex target; (2) the target is an arc that was nearly 90° along the chest wall, and the 90° arc in tangential direction enters the target without irradiating much of the lung. A hybrid VMAT plan achieves better dose conformality than a 3D-CRT plan, in the meantime reduces radiation dose to NTs than a pure VMAT plan. An additional advantage of using hybrid VMAT plan is a shorter radiotherapy course due to the SIB. In regard to the HI and CI, Mayo et al. found that improvement in the uniformity and conformality of target dose may be achieved by the hybrid IMRT plan of two 3D-conformal beams and four IMRT beams. However, the comparison between the hybrid VMAT plan and the hybrid IMRT plan has rarely been reported. In our study, the dosimetric parameters of the hybrid VMAT plans are generally close to those of the hybrid IMRT plans. It is worth noting that the CI of the hybrid VMAT plans is significantly higher than that of the hybrid IMRT plans. This fact suggests that hybrid VMAT plans might be more suitable for whole-breast irradiation with SIB than are hybrid IMRT plans. In breast radiotherapy, the lung is the primary and critical organ of concern. The Dmean, V5, and V20 are good predictors for radiation-induced lung toxicity., However, if the V20 of the ipsilateral lung was <30% for breast cancer patients, clinically significant pneumonitis should be rare. It has been also reported that the expected complication rate is 20% if more than 50% of the lung volume receives 10 Gy. In our study, the V5 and V10 of the contralateral lung are 5.71% and 0.26% in the hybrid VMAT plan; the D2 of the ipsilateral lung in the hybrid VMAT plan was not significant compared with the hybrid 45°-IMRT plan; and the V10 and V20 of the ipsilateral lung in the hybrid VMAT plan were lowest (33.56% and 25.49%, respectively). Thus, lung toxicity associated with the hybrid VMAT plans should be reasonably low. The heart is the most important organ to protect during left breast radiation therapy. In our study, the Dmean of the heart was the lowest (7.81 ± 1.60 Gy) in the hybrid VMAT plans, much less than the 12.2 ± 1.8 Gy reported by Goddu et al. for tomotherapy, and 8.7–21.1 Gy for the IMRT cases reported by Fogliata et al. Radiation-induced injuries of the heart appear mainly in the coronary arteries and connective tissues., In our study, the D2 of the left ventricle in the hybrid VMAT plan was reduced by 6% (P < 0.001) compared with the hybrid 15°-IMRT plan. The dosimetric parameters of the heart in the hybrid VMAT plan overall were moderately better than those of the hybrid IMRT plans, demonstrating that hybrid VMAT plans are also safer for the heart. For patients enrolled in the present study, the mean radiation doses to the ipsilateral lung, and the heart in 3D-CRT plans were 10.95 ± 1.93 Gy and 5.86 ± 1.90 Gy, respectively. These values were moderately lower than that in the hybrid IMRT or VMAT plans [Table 4]. The 3D-CRT plans included boost dose from electron beams. These data confirmed that using tangential beams in the hybrid plans could take advantage of the low NT doses in 3D-CRT plans. The dose to the contralateral breast is another critical factor to consider, especially for younger patients. Stovall et al. found an elevated long-term risk of developing secondary contralateral breast cancer, with the Dmean of 3.2 Gy to the contralateral breast with RapidArc. In our study, although the Dmean of the contralateral breast in the hybrid VMAT plans was higher than the other hybrid plans, the value (2.38 ± 0.84 Gy) was shown to be <4.3 ± 0.7 Gy reported by Goddu et al. and 2.82 Gy by Boice et al. More monitor units and extended therapy lead to higher doses to outfield NTs from leakage and scattered radiation, which in turn are likely to increase the incidence of radiation-induced malignancy. Hall and Wuu  evaluated the secondary neoplasia rate after 10 years and found that the rate of radiation-induced malignancy was 1% in 3D-CRT and increased to 1.75% in IMRT. Kry et al. demonstrated that compared with 3D-CRT, IMRT plans had an increased MU and varied dose distribution and that this difference would double the incidence of secondary solid tumors. In our study, the hybrid VMAT plans using two coplanar 90° arcs resulted in a much lower beam-on time and MUs (P < 0.001) than the hybrid IMRT plans. The effects of respiratory motion should be addressed for patients for whom breath control is not utilized. The interplay of respiratory motions and dose delivery will cause deviations from the planned dose distributions, which are more pronounced for IMRT or VMAT techniques. To reduce interplay effects or setup uncertainties, sufficient target expansion margin and daily image guidance maybe considered for patients who are treated with the hybrid plans investigated in this manuscript. Overall, our results show that the hybrid VMAT technique is feasible for adjuvant irradiation with SIB for left sided, early-stage breast cancer. Hybrid VMAT plans are especially superior to the hybrid IMRT plans with regard to heart dose and treatment delivery time. The authors would like to thank Dr. Adrian Koesters, Research Editor at University of Nebraska Medical Center, for her editorial contribution. Byers T, Wender RC, Jemal A, Baskies AM, Ward EE, Brawley OW. The American Cancer Society challenge goal to reduce US cancer mortality by 50% between 1990 and 2015: Results and reflections. CA Cancer J Clin 2016;66:359-69. Fisher B, Anderson S, Redmond CK, Wolmark N, Wickerham DL, Cronin WM. Reanalysis and results after 12 years of follow-up in a randomized clinical trial comparing total mastectomy with lumpectomy with or without irradiation in the treatment of breast cancer. N Engl J Med 1995;333:1456-61. Fisher B, Anderson S, Bryant J, Margolese RG, Deutsch M, Fisher ER, et al. Twenty-year follow-up of a randomized trial comparing total mastectomy, lumpectomy, and lumpectomy plus irradiation for the treatment of invasive breast cancer. N Engl J Med 2002;347:1233-41. Early Breast Cancer Trialists' Collaborative Group (EBCTCG), Darby S, McGale P, Correa C, Taylor C, Arriagada R, et al. Effect of radiotherapy after breast-conserving surgery on 10-year recurrence and 15-year breast cancer death: Meta-analysis of individual patient data for 10,801 women in 17 randomised trials. Lancet 2011;378:1707-16. Vinh-Hung V, Verschraegen C. Breast-conserving surgery with or without radiotherapy: Pooled-analysis for risks of ipsilateral breast tumor recurrence and mortality. J Natl Cancer Inst 2004;96:115-21. Favourable and unfavourable effects on long-term survival of radiotherapy for early breast cancer: An overview of the randomised trials. Early Breast Cancer Trialists' Collaborative Group. Lancet 2000;355:1757-70. Buchholz TA, Gurgoze E, Bice WS, Prestidge BR. Dosimetric analysis of intact breast irradiation in off-axis planes. Int J Radiat Oncol Biol Phys 1997;39:261-7. Kestin LL, Sharpe MB, Frazier RC, Vicini FA, Yan D, Matter RC, et al. Intensity modulation to improve dose uniformity with tangential breast radiotherapy: Initial clinical experience. Int J Radiat Oncol Biol Phys 2000;48:1559-68. Dogan N, Cuttino L, Lloyd R, Bump EA, Arthur DW. Optimized dose coverage of regional lymph nodes in breast cancer: The role of intensity-modulated radiotherapy. Int J Radiat Oncol Biol Phys 2007;68:1238-50. Beckham WA, Popescu CC, Patenaude VV, Wai ES, Olivotto IA. Is multibeam IMRT better than standard treatment for patients with left-sided breast cancer? Int J Radiat Oncol Biol Phys 2007;69:918-24. Zhao LR, Zhou YB, Sun JG. Comparison of plan optimization for single and dual volumetric-modulated arc therapy versus intensity-modulated radiation therapy during post-mastectomy regional irradiation. Oncol Lett 2016;11:3389-94. Popescu CC, Olivotto IA, Beckham WA, Ansbacher W, Zavgorodni S, Shaffer R, et al. Volumetric modulated arc therapy improves dosimetry and reduces treatment time compared to conventional intensity-modulated radiotherapy for locoregional radiotherapy of left-sided breast cancer and internal mammary nodes. Int J Radiat Oncol Biol Phys 2010;76:287-95. Nicolini G, Clivio A, Fogliata A, Vanetti E, Cozzi L. Simultaneous integrated boost radiotherapy for bilateral breast: A treatment planning and dosimetric comparison for volumetric modulated arc and fixed field intensity modulated therapy. Radiat Oncol 2009;4:27. Jin GH, Chen LX, Deng XW, Liu XW, Huang Y, Huang XB. A comparative dosimetric study for treating left-sided breast cancer for small breast size using five different radiotherapy techniques: Conventional tangential field, filed-in-filed, tangential-IMRT, multi-beam IMRT and VMAT. Radiat Oncol 2013;8:89. Badakhshi H, Kaul D, Nadobny J, Wille B, Sehouli J, Budach V. Image-guided volumetric modulated arc therapy for breast cancer: A feasibility study and plan comparison with three-dimensional conformal and intensity-modulated radiotherapy. Br J Radiol 2013;86:20130515. Jöst V, Kretschmer M, Sabatino M, Würschmidt F, Dahle J, Ueberle F, et al. Heart dose reduction in breast cancer treatment with simultaneous integrated boost: Comparison of treatment planning and dosimetry for a novel hybrid technique and 3D-CRT. Strahlenther Onkol 2015;191:734-41. Lin JF, Yeh DC, Yeh HL, Chang CF, Lin JC. Dosimetric comparison of hybrid volumetric-modulated arc therapy, volumetric-modulated arc therapy, and intensity-modulated radiation therapy for left-sided early breast cancer. Med Dosim 2015;40:262-7. Mayo CS, Urie MM, Fitzgerald TJ. Hybrid IMRT plans – Concurrently treating conventional and IMRT beams for improved breast irradiation and reduced planning time. Int J Radiat Oncol Biol Phys 2005;61:922-32. White J, Tai A, Arthur D, Buchholz T, MacDonald S, Marks L, et al. RTOG Breast Cancer Atlas for Radiation Therapy Planning: Consensus Definitions. Available from: https://www.rtog.org/CoreLab/ContouringAtlases/BreastCancerAtlas.aspx. [Last accessed on 2016 Aug 30]. Tsai PF, Lin SM, Lee SH, Yeh CY, Huang YT, Lee CC, et al. The feasibility study of using multiple partial volumetric-modulated arcs therapy in early stage left-sided breast cancer patients. J Appl Clin Med Phys 2012;13:3806. Donovan E, Bleakley N, Denholm E, Evans P, Gothard L, Hanson J, et al. Randomised trial of standard 2D radiotherapy (RT) versus intensity modulated radiotherapy (IMRT) in patients prescribed breast radiotherapy. Radiother Oncol 2007;82:254-64. Pignol JP, Olivotto I, Rakovitch E, Gardner S, Sixel K, Beckham W, et al. A multicenter randomized trial of breast intensity-modulated radiation therapy to reduce acute radiation dermatitis. J Clin Oncol 2008;26:2085-92. Selvaraj RN, Beriwal S, Pourarian RJ, Lalonde RJ, Chen A, Mehta K, et al. Clinical implementation of tangential field intensity modulated radiation therapy (IMRT) using sliding window technique and dosimetric comparison with 3D conformal therapy (3DCRT) in breast cancer. Med Dosim 2007;32:299-304. Wu Q, Mohan R, Morris M, Lauve A, Schmidt-Ullrich R. Simultaneous integrated boost intensity-modulated radiotherapy for locally advanced head-and-neck squamous cell carcinomas. I: Dosimetric results. Int J Radiat Oncol Biol Phys 2003;56:573-85. Jiang QF, Bai S, Fu YC, Li GJ, Zhang H, Ai P, et al. Feasibility of volumetric modulated arc therapy applied to breast cancer radiotherapy after radical surgery. J North Sichuan Med Coll 2012;27:102-8. Kimura T, Togami T, Takashima H, Nishiyama Y, Ohkawa M, Nagata Y. Radiation pneumonitis in patients with lung and mediastinal tumours: A retrospective study of risk factors focused on pulmonary emphysema. Br J Radiol 2012;85:135-41. Wang S, Liao Z, Wei X, Liu HH, Tucker SL, Hu CS, et al. Analysis of clinical and dosimetric factors associated with treatment-related pneumonitis (TRP) in patients with non-small-cell lung cancer (NSCLC) treated with concurrent chemotherapy and three-dimensional conformal radiotherapy (3D-CRT). Int J Radiat Oncol Biol Phys 2006;66:1399-407. Blom Goldman U, Wennberg B, Svane G, Bylund H, Lind P. Reduction of radiation pneumonitis by V20-constraints in breast cancer. Radiat Oncol 2010;5:99. Yorke ED, Jackson A, Rosenzweig KE, Braban L, Leibel SA, Ling CC. Correlation of dosimetric factors and radiation pneumonitis for non-small-cell lung cancer patients in a recently completed dose escalation study. Int J Radiat Oncol Biol Phys 2005;63:672-82. Goddu SM, Chaudhari S, Mamalui-Hunter M, Pechenaya OL, Pratt D, Mutic S, et al. Helical tomotherapy planning for left-sided breast cancer patients with positive lymph nodes: Comparison to conventional multiport breast technique. Int J Radiat Oncol Biol Phys 2009;73:1243-51. Fogliata A, Nicolini G, Alber M, Asell M, Dobler B, El-Haddad M, et al. IMRT for breast. A planning study. Radiot Oncol 2005;76:300-10. Giordano SH, Kuo YF, Freeman JL, Buchholz TA, Hortobagyi GN, Goodwin JS. Risk of cardiac death after adjuvant radiotherapy for breast cancer. J Natl Cancer Inst 2005;97:419-24. Yu X, Zhou S, Prosnitz RG, Kahn D, Hardenbergh PH, Hollis D, et al. Persistence of radiation (RT)-induced cardiac dysfunction 3-5 years post RT. Int J Radiat Oncol Biol Phys 2004;60:S390-1. Boice JD Jr., Harvey EB, Blettner M, Stovall M, Flannery JT. Cancer in the contralateral breast after radiotherapy for breast cancer. N Engl J Med 1992;326:781-5. Hall EJ, Wuu CS. Radiation-induced second cancers: The impact of 3D-CRT and IMRT. Int J Radiat Oncol Biol Phys 2003;56:83-8. Kry SF, Salehpour M, Followill DS, Stovall M, Kuban DA, White RA, et al. The calculated risk of fatal secondary malignancies from intensity-modulated radiation therapy. Int J Radiat Oncol Biol Phys 2005;62:1195-203. Zhou S, Zhu X, Zhang M, Zheng D, Lei Y, Li S, et al. Estimation of internal organ motion-induced variance in radiation dose in non-gated radiotherapy. Phys Med Biol 2016;61:8157-79.